Amnesia, the legendary strain from the Netherlands. This Amnesia is a direct descendent of the original Amnesia that was bred in the late 90’s. It has been a best seller in Dutch coffee shops for nearly a decade now. 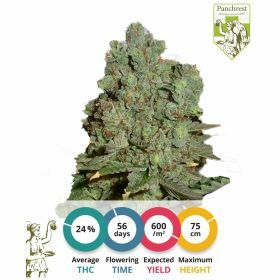 Its flavor is best described as a mixture of floral, fruity tastes and a strong haze aroma. The buds that this plant generates are dark green, compact and full of crystals. 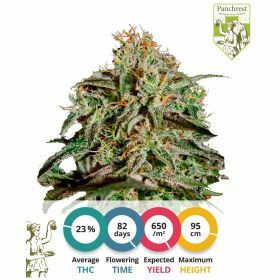 The Dutch growing scene loves these genetics and growers all over the country have been growing Amnesia extensively for the past couple of years. At the time of writing the Netherlands is actually experiencing an Amnesia surplus, because of its apparent popularity. 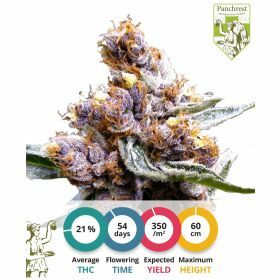 Panchrest´s Amnesia is one that will blow a grower´s and smoker´s mind. The plant will grow fast, to an average length of about 100 centimeters. Amnesia is best grown indoors to get the exotic flavor and high out of these genetics. However, she can be grown outdoors in warm areas as well. This Amnesia is a very high yielding strain that can easily produce more than 750 grams per square meter. Growers should however be aware that it is not the easiest plant to grow. Amnesia will dislike low temperatures, bugs and overall swings in climate. But, if you can satisfy her needs, she will give you everything you have ever wanted, and more. 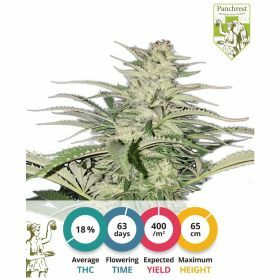 Grow advice: Amnesia is a sensitive plant. It needs perfect temperature (28 degrees Celsius) to produce A-quality buds. Make sure you give the plant enough nutrients so that it can grow to its full potency. Effect of this strain: this strain gives a very hard high and a lovely mellow stoned feeling. Some users indicate that the strain has strong psychedelic properties and should be smoked with a lot of care and caution. So, beware if you are an inexperienced smoker.